Cheryl Esposito welcome Philo Ikonya of Kenya, a human rights activist, social change motivator, ardent poet, writer and lecturer. Philo holds postgraduate degrees in the Arts and consults on gender, governance and media issues. Philo courageously writes about the injustices of Kenya. In her series, Kenya Is Burning, she reflects on her country’s struggles with the devastating violence that has claimed so many lives and turned its people against each other. “The women of Kenya have always been aware of injustice in our society…we’ve always known that the deep inequalities in our country would lead to the destruction of this nation.” Philo has decided to wear sacks instead of regular clothes to protest the current violence in Kenya. 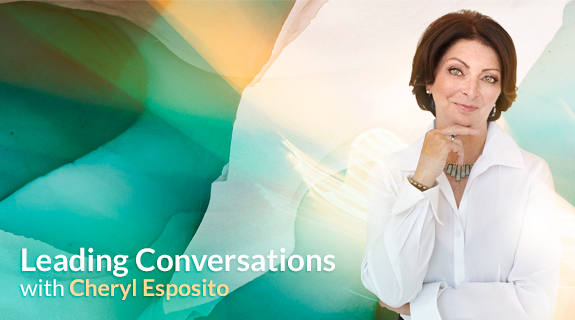 She has helped organize a campaign urging Kenyan women to wear sacks for clothes “for as long as we do not have peace in Kenya; as long as we do not have justice and reform.” Listen to this episode of Leading Conversations with Cheryl Esposito to hear this extraordinary story.